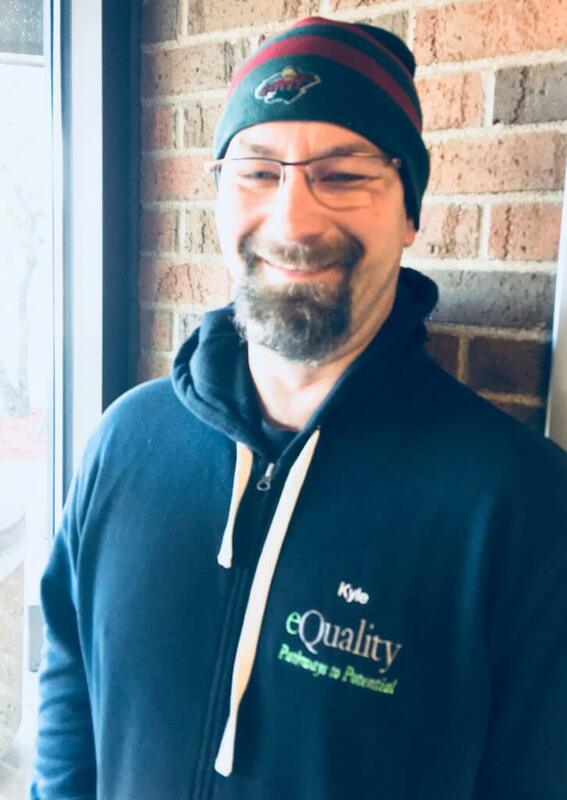 I’m Kyle Hedquist, I’ve been with eQuality full time as a Job Coach since October 2016 at our CommonBond Communities location. I’ve enjoyed watching our Associates grow in their own work environment. My 3 daily goals at eQuality is to see our associates be safe , Independent, and see all of our associates return to work the next day. I’m proud to be apart of a work place that encourages challenges to build on and such a verity of tasks to create achievable goals. Out of work I enjoy being with my wife of 11 years, our daughter, and dog . Also, All Travel, (Jamaica the most) camping, listening to music,( I can only play a shoe horn) fishing, hunting, gardening, anything out doors, cooking,(oh yeah! lots of cooking!) snow shoeing, disc golf , Lake Superior Agate picking, bonfires and so much more.